Panasonic has introduced the new Stain Master Plus series of washing machines with top load, in India. These washing machines come in 10 kg (NA-F100V5LRB) and 14 kg (NA-FS14V5SRB) capacities. These are intelligent washing machines and are powered by ECONAVI technology which detects the laundry load and input water temperature and automatically adjusts the optimal operation for energy, water and duration of wash. These machines come equipped with an Inbuilt Heater, for a better wash.
Irrespective of how dirty the clothes are or what the weather conditions are like, these machines deliver washing performance, almost at par with professional laundromats at home as claimed by the company. 99.9% Bacteria Elimination can also be achieved with this hot wash. Also available in the regular Stain Master series (without hot wash) are 18 different models and in 7 different colours ranging from White to Charcoal Grey, from Red to Floral blue. Price of these machines ranges from INR 20,000 to INR 60,000. This new Top loading range of washing machine also has ‘Active Foam Technology’ which uses Foam to remove stubborn stains such as Mud, Sweat, Sauce, Curries and difficult to clean areas like Cuffs & Collars, at a press of a button. 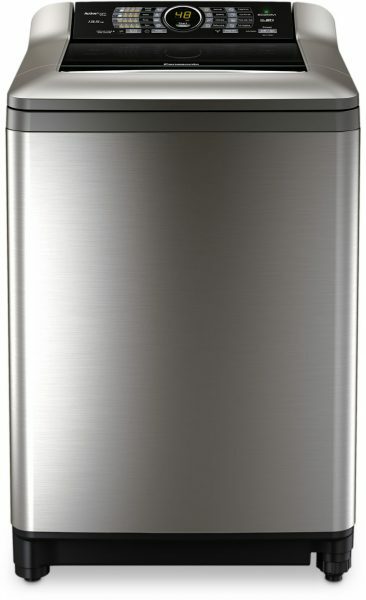 Additionally, the bacteria elimination feature in Stain Master plus Models, soaks and washes clothes in hot detergent solution to eliminate common Bacteria like E-Coli & Staphylococcus for an extra hygienic wash.
Stain master range of washing machines also have an Aqua Spin Rinse feature which ensures 100% removal of detergent from clothes while saving 25% water as compared to other machines as further claimed by Panasonic. Additionally, Gentle Hand Wash is a feature which allows users to wash even the most delicate items like embroidered garments, lace and fine silks, which they normally hesitate to put in a washing machine, and set aside to wash by hand. These machines are ergonomically designed with large see through glass lid. Designed at an angle, topped with a completely water proof user panel, loading and unloading clothes is now a breeze. The washer lids are made of Toughened glass, and can withstand upto 60 kg of weight; making them the sturdiest of machines in the market today.